Renowned for his coverage of China's elite politics and leadership transitions, veteran Sinologist Willy Lam has produced the first book-length study in English of the rise of Xi Jinping--General Secretary of the Chinese Communist Party (CCP) since November 2012. With rare insight, Lam describes Xi's personal history and his fascination with quasi-Maoist values, the factional politics through which he ascended, the configuration of power of the Fifth-Generation leadership, and the country's likely future directions under the charismatic "princeling." Despite an undistinguished career as a provincial administrator, Xi has rapidly amassed more power than his predecessors. He has overawed his rivals and shaken up the party-state hierarchy by launching large-scale anti-corruption and rectification campaigns. With a strong power base in the People's Liberation Army and a vision of China as an "awakening lion," Xi has been flexing China's military muscle in sovereignty rows with countries including Japan, Vietnam, and the Philippines while trying to undermine the influence of the United States in the Asia-Pacific region. While Xi is still fine-tuning his art of governance, his zero tolerance for dissent and his preoccupation with upholding the privileges of the "red aristocracy" and the CCP's status as "perennial ruling party" do not bode well for economic, political, or cultural reforms. 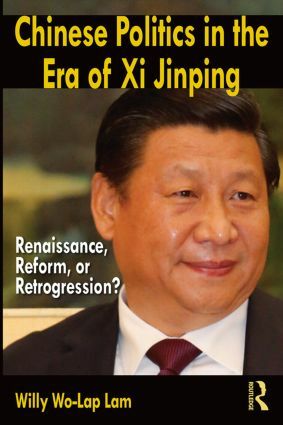 Lam takes a close look at Xi's ideological and political profile and considers how his conservative outlook might shape what the new strongman calls "the Great Renaissance of the Chinese race." "A vivid and compelling account of where quasi-superpower China is being taken by its new supreme leader, Xi Jinping. Informed by the insights of the leading analyst of contemporary Chinese politics, Willy Lam offers a fast-paced and up-to-date biographical account showing why wishful thinkers about the single-party dictatorship's future need to re-think what's really happening in China. A must read with frightening implications." "Following on his acclaimed studies of Deng Xiaoping, Jiang Zemin, and Hu Jintao, veteran analyst Willy Wo-Lap Lam has now produced a detailed and balanced portrait of Xi Jinping. Lam’s assessment of Xi’s personality, career, and worldview provides remarkable insight into the prospects for China’s economy, political system, and international role under its strong and determined new leader." "Chinese civilization has survived interludes of violent rule in the past and someday will emerge from its Communist period as well. Meanwhile, the crisis that looms today under Xi Jinping, who brings an unusual combination of narrow vision and brash initiative, augurs more trouble for the Chinese people and likely for the world as well. No one does better than Willy Lam in showing, in meticulous and comprehensive detail, why this is so." "Veteran China expert Willy Lam has done it again--producing the first significant book on Xi Jinping's rise and consolidation of power. Based on prodigious research and filled with keen insights, this book should be read carefully by all China watchers." "This is a brilliant book that brings a deep understanding of the Chinese past to bear on the present and possible futures. Willy Lam is the authority on this subject; at least as well informed and insightful as a whole embassy full of specialists. His work just gets better and better." " Xi Jinping knows that in his lifetime, China will not challenge the power of the United States in the world. He thinks however achieved in the Asia-Pacific region. From this point of view, the maritime version of the new Silk Road is of great geopolitical importance. Not only to counter the Americans, but also the Indians." "In his recent book, Chinese Politics in the Era of Xi Jinping, Willy Wo-Lap Lam, a veteran observer of Chinese elites, explains that since taking over as general secretary in November 2012 and president of China in March 2013, Xi has centralized power under his leadership to an extraordinary degree, creating and chairing the new Central National Security Commission, which has jurisdiction over the army, the police, and all foreign-related and national security agencies, along with chairing the Central Military Commission, which comes with his job as CCP general secretary."